As I am apt to do now that I have the Bar Exam staring me down dead to rights, I have drifted off into a moment of non-legal thinking. So I started looking up different Masonic terms in Google (what would a kid with short attention span do without you Goog.) and found on the Iowa Grand Lodge Masonic Library a paper on what a Volume of Sacred Law (or VSL) is and the proper way to present a VSL in Lodge during different rituals. I am fascinated with the subject of comparative religion and I think that being a member of this Fraternity, with our desire to meet on the level with all brothers who believe in a Supreme Being regardless how he (or she) is named, gives us great opportunities to learn about each other. All Lodge meetings in the state of Minnesota must have an open Volume of Sacred Law. So what is a VSL? The Grand Lodge of Minnesota explains, through example, that "the Volume of the Sacred Law to a Christian is the Bible; to Freemasons of other faiths, it is the book held holy by them. "(Minnesota Masonic Code S1.19) VSLs should be regarded as those holy writings that bind a man to his belief in the Supreme Being. But why do we swear on the VSL? It is to show our sincerity of purpose by acknowledging to our brothers that G-d is binding all of us together, no matter his name or how we worship him, to the same oath and belief in our Fraternity. In my Lodge, we have both the Holy Bible and the Tanakh resting on the Altar. (pictured above) It is a beautiful sight to behold. In my mind, it represents the equality that both faiths, and indeed all faiths, have within the Lodge Room. No taking sides, no "mine is better than yours", the situation is just equality. The paper that I found was written by Very Worshipful Brother Lin Boon Par of Singapore and explains what a Volume of Sacred Law is to each faith and how a brother of that faith may use it in a Masonic ceremony. As I am sure we are aware, the country of Singapore, and indeed much of Southeast Asia, has a wide range of religious belief and choice, from Buddhism and Taoism, to Christianity and Islam. All of these belief systems can meet within the confines of the Lodge because the brothers share a collective belief in the Supreme Being. Therefore, it seems fitting that a brother from such a diverse culture would set out such an impressive list for us, the practicing, speculative Mason, to use when accepting these brothers and candidates into the Lodge. I will only point out a few interesting nuggets from the paper that have been burning questions in my mind. The first is how a Muslim candidate is initiated using The Qu'ran. There are in fact three methods for the candidate to swear on The Qu'ran in Lodge: 1) the candidate and another Muslim brother must undergo ceremonial washings so as to be able to touch The Qu'ran with bare hands and is held over the swearing brother's head; 2) The Qu'ran is wrapped up in cloth and is held in the hands in the usual method; or 3) those that must handle The Qu'ran wear gloves (in many other countries, it is common practice to wear white gloves; sadly, this is not the case in the states.) and the candidate washes himself in the manner of his faith. The other situation surrounding VSLs is when a Buddhist swears on the Holy Bible or on whatever VSL is on the Altar. The method by which a Buddhist makes an obligation is by first going to his temple to pray after which time he takes the obligation. There is no equivalent oath taking between Christians and Buddhists. However, the obligation still becomes binding upon the brother because of his sincerity regardless of whether it was made on his VSL or a substitute VSL. The reason I point out the way in which a Muslim or Buddhist brother is sworn is that I live in Minnesota which has a growing population of Muslims, primarily from East Africa, and I also live within a few miles of a Buddhist temple and it is quite possible that Lodges in this state may need to know the proper way to conduct candidates of many different faiths. I love living in my state because I am able to see the beauty and diversity of multiculturalism. I mentioned on my guest article on Brother Ant's site, "The Rough Ashlar" that in the state of Minnesota, non-whites accounted for more than 62% of the total immigration to the state. In fact, when I go to work each morning, I can see the differences in faith. While riding the train to and from work, I am able to see women in flowing hijabs, men with yamalkas, nuns in habits, and even Buddhist monks in their golden robes and instead of feeling scorn, I have a sense of wonder and tolerance. As Freemasons, we should also have that sense of tolerance. We are only asked one simple question when it comes to belief: "Do you believe in a Supreme Being?" We are asked this once and it never needs to be brought up again because the Freemason is not supposed to care what religious tradition you follow, only that you share that same belief in Deity. It will be interesting to see how the future of Freemasonry in the United States will be affected by these changing demographics. I am not the only blogger from the Grand Lodge of Minnesota, AF&AM. In fact, we have three other brothers that participate in Masonry on Internet. These brothers have many different qualities and offer many great insights into the world of Masonry. It may be unfair to call this first brother's website a blog as he has published it as a monthly email newsletter since '99 but I think it is always important to point out the work that is done on one of my favorite sites, Cinosam especially when discussing Minnesota Masonry online. The first brother is a past Grand Master of Minnesota and the current Grand Orator of the Grand Lodge of North Dakota, Most Worshipful Brother Neil Neddermeyer. I have discussed Cinosam previously but I still think that it is worth noting how great the resources that an interested brother can find are. MW Bro. Neddermeyer has written much on the subject of Masonic revival and in fact, is the Chairman of the Masonic Renewal Committee for the Conference of Grand Masters of Masons in North America. He is a brilliant philosopher of the Craft and has contributed much to my Masonic education. I suggest if you are a Masonic officer or have been nominated to be an officer, get prepared now with the resources on his site. The second brother is the Southeast Area Deputy of the Grand Lodge of Minnesota, Worshipful Brother James McNeely. W Bro. James writes the SE Area Travels blog and has proven to be the best Area Deputy we in the Southeast could have hoped for. His blog presents a day in the life of a very active Brother dedicated to helping the Lodges of the Southeast succeed, from the small town Lodges to the large Lodges of the Rural centers. W Bro. James is also the Junior Warden of Educational Lodge #1002 which has been incredibly active in the study of Masonry. I find W Bro. James has been very encouraging for my Lodge and I as we began our renewal as a strong successful Lodge. In fact, W Bro. James has encouraged me to begin my journey to become a certified lecturer. I really believe that with leaders like W Bro James, Masonry has all the tools they need to survive and thrive. The third brother that I would like to feature is relatively new to the Masonic blog scene. Worshipful Brother Olaf Kuhlke is a Geography Professor who has written a very insightful book (which I have written about before) and has presented many of his theories of the Craft to Lodges throughout the State. I was fortunate to have seen W. Bro. Kuhlke's presentation on the connection of Freemasonry and one's inner self and it was, in a word, insightful. Now, he has decided to present his ideas through a blog entitled Dr. K's Masonic Blog. I really want to thank W. Bro. Olaf for having brought his ideas to the Internet and I hope you will find his blog as insightful as I do. If you are looking for erudite discussions on Freemasonry, look no further than Dr. K's Masonic Blog. All three of these brothers have dedicated their lives to Freemasonry and I salute all of them for their efforts. When I look at the great intelligence displayed by these brothers, I began to remember how young and new to the Craft I really am. I know that I have much to learn from each of them in the study of Freemasonry and would like to thank all of them for their dedication to the Grand Lodge of Minnesota, AF & AM. I hope to spotlight more brothers in this State who have taken it upon themselves to help Freemasonry grow in numbers or through wisdom. Are you looking for a fun and informative podcast? Do you like comedy? Do you wish you could have the "No-Peekie" Hoodwink Staple Gun? I think it is time for you to listen to the Setting Maul podcast. I discovered this show after I heard from another brother that there were many more Masonic podcasts than I had originally known about. So I downloaded the whole lot of shows and began listening. Wow! These brothers have found a way to explain Masonry through the use of humor and their enthusiasm for the Craft really makes this show shine. These three brothers, Ja, Jo and Jum broadcast their thoughts from the clefts of Freemasonry giving insights about Craft Masonry, Scottish Rite and beyond. I am thankful that new media is being used to broadcast our message and these brothers are able to use it to in their words, to "restor[e] Brotherly Love and Friendship through comedy and satire about Freemasonry." Two warnings: 1) the podcast is listed as "Explicit" under the iTunes store for a reason, and 2) do not drink liquids while listening to this show; let's just say my sinuses are clear. Stay tuned for more shows from these brothers as they continue to spread their message of Freemasonry. The website for the Masonic Renewal Committee of the Conference of Grand Masters of North America has been updated. The Masonic Renewal Committee seeks to improve the Craft leadership and renew excitement in Freemasonry among the brothers. The Committee is chaired by Past Grand Master Neil Neddermeyer, author of the Cinosam website. The site includes many resources that have been compiled by the different Grand Lodges in North America on issues of membership, leadership and just a general desire to revive Freemasonry. If you are a Masonic leader, you need the resources on this site. Everything from Lodge Programs, Membership Recruitment and Retention, even Masonic Education. I will be visiting this site frequently as I prepare (should tradition prevail) to take my turn in the East. Anyone who has been given a role as a Masonic leader, including Past Masters, should take advantage of this site. Although there will always remain those Grand Lodges that seek to protect information they have compiled, I believe the vast majority understand the situation surrounding the general concept of renewal. Sharing information amongst the Grand Lodges and their constituent Lodges will, in my opinion, only do good for our future. The website has printed on the top, "[b]uilding a foundation for the future on the finest traditions of the past." This short message provides great insight into the future of Masonry. We should take stock of the tools we have and use them to build a better, stronger body of Masonry. I want to thank the Masonic Renewal Committee for providing information and resource to improve our Lodges. Entertainment Tonight interviewed Ron Howard, director of the The Da Vinci Code and Angels and Demons, who stated that Dan Brown has officially finished his book, tentatively entitled, The Solomon Key. Now it has to be remembered that this is hearsay and we really have no matter of fact evidence including any word from Dan Brown or his publisher, Doubleday. Speculation for release dates include June 24th, St. John's Day, or September 18th, the date the cornerstone of the US Capitol was laid. Whatever date it comes out, I hope we will be able to brace for the public excitement or scrutiny of the Fraternity. I can't imagine how crowded the West Gate will be and if we will be able to maintain the interest of the qualified candidates with Masonic education opportunities. We will see. "Get out." No matter how well we do public relations, there still remains in this world some amount of anger towards our gentle Craft. Although it is possible that this could have been teenagers, I am convinced that it was an adult. What could drive a person, an adult, to deliver this kind of hateful message? I really can't answer that question. When I entered my Lodge, I knew there were Anti-Masons. I have been studying Political Science for years and knew the story of the Anti-Masonic Party. But I really have never met an "Anti" and I can't understand the anger that is aimed towards us. Perhaps the vandal was a former member, maybe he has a religious belief about us or he perhaps could be incapacitated. As I described in an earlier post, when I speak with the public, I try to explain Masonry as fully as I can. Although I am not sure what to say exactly, I try to explain that we have been members of the community for years. We do good works for our members and the community. Many of the great men in the world have been Masons. Sadly, it seems that although we try to help people understand who we are, there is always someone who believes the conspiracy theories. Even though I am sad that this event happen and my thoughts are with my brothers in Ontario, I think we can survive events like this. We are strong, this band of brothers and we must soldier on, never looking back when someone attempts throw us off our path. I am certain that the brothers of St. John's Lodge No.35, St. Andrew's Lodge No. 62, Enniskillen Lodge No. 185 and Hiram Lodge No.319 will dust themselves off. They have been a part of the community longer than anyone has been alive and will remain indefinitely into the future. We will not "get out." Brother Greg Stewart over at the Masonic Traveler blog inspired me to think about Freemasonry on the web. I have decided to focus on one very particular aspect of e-Masonry (a term I hate), the Lodge website, in particular, the bare bones basic of what a Lodge website should have. I have been pondering this question after I began to look at different Lodge websites. The quality and style varies completely from Lodge to Lodge, Grand Lodge to Grand Lodge. However, I thought it might be helpful for me to list what I think are the most important elements that a Lodge should include when creating a website. Lodges should strive to create a welcoming beginning for the curious searcher. One of the first elements that a person sees should be an impressive picture. It could be a picture of the Lodge Room, the exterior of the Lodge building, or even a video made by a Lodge brother about the Lodge. Also, when the homepage comes up, don't have music playing, it is incredibly annoying. I would also avoid old style HTML pages as they look outdated and are incredibly hard to update which is important in this fast changing world. It is essential that a person can navigate to nearly everywhere on the front page. Remember that the homepage is not a welcome mat but the entryway. We want people to feel comfortable the second they find us. The event calendar is essential for keeping brothers aware of the going-ons in the Lodge. It is important to remember that the website should be informative to both those from outside the Lodge as well as to brothers within the Lodge. The event calendar should be easily available, perhaps even on the front page. An event calendar is also helpful for brothers that are not a part of the Lodge by giving them an idea of when they can visit the Lodge and what to expect when they get there. It is important that we tell the story of our Lodges. Every Lodge has a story, a story of when it was formed, by whom, famous members, interesting facts, etc. It is important that we tell the story and not let someone else do that for us. These stories become a single piece of the larger story of Freemasonry. It is important that they be made known. The Lodge website should list the officers of the Lodge. The reason for this is the same as the event calendar, brothers need to know who to contact if they have been gone for a while. It also allows those brothers in the line to give information back to the brothers about who they are. I am a blogger so I have a vested interest in maintaining this most efficient way to communicate. That being said, a blog is invaluable in forwarding the immediate messages to the brothers or providing up to the minute news about the Lodge. It is easy to set-up and adding new entries to a blog is fast. Blogs allow for communications between newsletter issues. Blogs don't have the same expectations of journalism and allows for a conversational tone. Do you have a lot of photos from the Lodge? Get on Flickr. Flickr allows photostreams to be embedded on to websites. How about a movie made about the Lodge? Just upload the video on to Youtube and embed the video on the site. The best part of all these sites: They're free! Why pay expensive bandwidth costs when Google and Yahoo will do that for you. A contact form should be included to allow brothers, potential petitioners and the public to be able to get into contact with the Lodge. Brothers from out of town may want to visit the Lodge, while potential petitioners may want to meet to get better acquainted with the Fraternity to learn about what we do. It is also important that we give an opportunity to the public to speak to us about an event we may want to be a part of in the community, or perhaps someone has a question about a deceased brother. We need that buy-in with the community to again be relevant. This element I am sure will cause the most discord, but I believe that petitions should be available online. It needs to be noted that the petition is only one part of the initiation process. In fact, in Minnesota, a brother needs two brothers to sign his petition to be considered to be eligible for the degrees. The petition section and the contact section should function in tandem, providing the potential candidate with the petition to read and a way to get into contact with the Lodge to be met by brothers of the Lodge. In the new era of Freemasonry, more brothers will be arriving without knowing someone who is a Mason. In my case, it was my grandfather that was a Mason who got me involved in Freemasonry and my father joined through me. 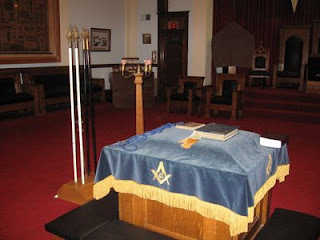 However, it is more often than not that a brother will have no connection to the Lodge and very likely not knowing a Mason at all. Offering the petition online allows the potential brother to have control over his destiny in taking the path to Freemasonry. Now this list is not in any particular order and I think all of them are important in improving one of the great communication tools that Lodges can use. Websites give Lodges and Grand Lodges the ability to define who we are and what we do and allows those potential brothers with no connection to Freemasonry to finally have a way into the Fraternity. As many of you who watch my Twitter stream may have seen, I planned and worked the Kids ID booth at the Farmington Expo on Saturday, January 31st. Kids ID is a program where we take height and weight measurements, fingerprints and photos and give the photo disk and info sheet to the parents to take home. During our time there, we, at the table, received a common question, "Who are you guys?" and "What do you guys do?" Normally, I am never for a lack of words but in this case, I was. The person who asked was a woman in her thirties who worked across the street from the Lodge. She had described that she had seen our red door and was wondering what the heck we do. So I stated that we give money to various charities, including the Cancer Center at the U and the local committee on community charity but she wanted to know what we "do". As Masons, we are given a canned response to the question of what Masonry is: "a beautiful system of morality, veiled in allegory and illustrated by symbols." But this is frankly not really expositive of anything and makes the questioner feel like we are either being evasive or condescending. So we can then turn to Mackey who stated that "Freemasonry is not a system of morality, either its Speculative form or its Operative form, and was never intended to be, but is a fraternity or brotherhood of men of which the grand idea is work." (Encyclopedia of Freemasonry, Part 3, "Ethics and Morals") So what we gave as an answer jives with this definition but the definition still lacks clarity. So, here I stand as a Mason with an identity problem. I can talk to brothers about Freemasonry, guys who want to be Masons, even my wife and my mother who can't be Masons, yet I find it very difficult to explain who we are and what we do to people who cannot be Mason in the public. Are we a system of morality, are we a charitable organization, are we "workers", and if so, of what, are we a fraternity, or are we just a group of guys who get together to engage in old stuff. The dust has settled rather thickly on Freemasonry and as the public seems less knowledgeable of who we are and what we do, we are going to need to find ways to shake that from the Square and Compass or risk becoming a further obscurity to the public. I felt a little embarrassed that I could give her a better response. For someone like myself, I usually have an answer, even if it isn't right. There must be a better phrase, a better explanation that we can use to describe ourselves and our Craft but I just don't know it yet. I just haven't found the right answer yet.